Climate, plant communities, and timing of floral resources differ significantly between north, central, and south Florida. 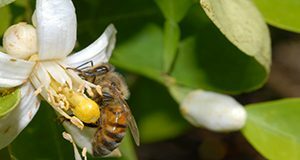 While many plants are acceptable pollen producers for honey bees, fewer yield enough nectar to produce a surplus honey crop. The tables in this 12-page fact sheet written by Mary Christine Bammer, William H Kern, and Jamie D. Ellis and published by the UF/IFAS Entomology and Nematology Department list the nectar-bearing plants that are present to some degree in each region and the bloom times for each plant.